Updated 1:45 p.m. | Posted 12:03 p.m. 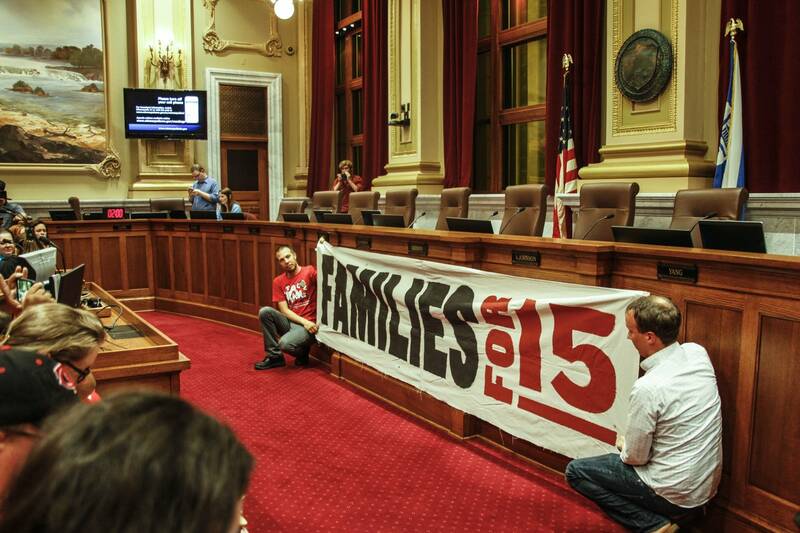 The Minneapolis City Council on Friday voted nearly unanimously to raise the minimum wage in Minneapolis to $15 an hour. The higher wage will be phased in over five years for large businesses, seven years for small. Businesses with 100 employees or more will be required to start paying a higher wage in January 2018. Supporters say the higher wage will especially benefit low-income and people of color. Some critics, though, warn the ordinance may chase cost-conscious consumers out of the city and force Minneapolis small businesses to cut staff or reduce hours to offset the required higher wages. Council members had signaled their support for the measure on Wednesday after approving amendments, including extending the phase-in time for small businesses to seven years. Council member Blong Yang was the lone no vote among 13 council members. Yang acknowledged racial inequities across the city and in his ward. But he said one of the best ways to fight the disparities is to make it easier for people of color and immigrants to become business owners. "Entrepreneurs of color also hire more people of color," Yang said. "At $15 an hour, with the minimum wage, is an increased barrier to entrepreneurs and small business owners I represent." The ordinance includes a five-year phase in for businesses with 100 or more employees and a seven-year phase in for small companies. Council member Jacob Frey, who is running to replace Mayor Betsy Hodges this fall, amended the ordinance to clarify that certain franchisers like fast food restaurants will qualify as big businesses, even though a particular store may have less than 100 workers. His amendment also contained a provision which allows sole proprietors of multiple businesses to take the seven-year path to $15. Council member Cam Gordon opposed that part of the amendment. "I guess my concern would be if you had a large restaurant — or you had three large restaurants and it was a sole proprietorship and you owned them all — then you'd be on a slow track. But if they were all in one location, you'd be on the fast track of a large business," said Gordon. "So it sounds like a carve-out for our biggest restaurants." Before she registered her yes vote, council vice president Elizabeth Glidden thanked the dozens of advocates, many of them holding signs, seated in the chamber. She thanked them for pushing the council toward taking the action and Glidden said it was a victory for them. Members of the advocacy group 15 Now Minnesota called the passage of the ordinance "historic," although some advocates are still not thrilled. They point out that it will take seven years for people working for small businesses to get to $15. Members of a group called Pathway to $15 wanted the council to make an exception for tipped workers. They want tips to be counted towards the $15. That way, restaurant owners can increase pay for kitchen staff without making drastic staffing changes. "The City Council has failed tipped restaurant workers in Minneapolis," Jennifer Schellenberg, a bartender at Red Rabbit restaurant, said in a written statement. "We won't give up the fight but we remain disillusioned about how our concerns were dismissed for the sake of campaign politics." Some small business owners have said they also oppose the higher wage because they fear it will put them at a competitive disadvantage. Higher costs for labor, may force them to cut employee hours or reduce the number of people they employ. Supporters of the ordinance took up all the seats in the Minneapolis City Council chambers Friday and erupted in cheers and applause after the final roll call vote, which was 11-1 inside the chamber. Council member Abdi Warsame, a co-author of the ordinance, was on a pilgrimage to Mecca and added his yes vote from afar.